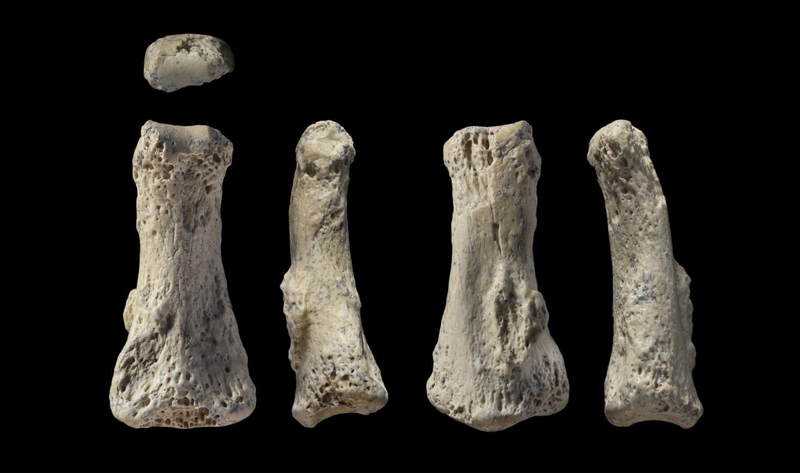 A project led by the Max Planck Institute for the Science of Human History has discovered a fossilized finger bone of an early modern human in the Nefud Desert of Saudi Arabia, dating to approximately 90,000 years ago. The discovery, described in Nature Ecology and Evolution, is the oldest directly dated Homo sapiens fossil outside of Africa and the Levant and indicates that early dispersals into Eurasia were more expansive than previously thought. The results, published in Nature Ecology and Evolution, detail the discovery made at the site of Al Wusta, an ancient fresh-water lake located in what is now the hyper-arid Nefud Desert. Numerous animal fossils, including those of hippopotamus and tiny fresh water snails were found at Al Wusta, as well as abundant stone tools made by humans. Among these finds was a well preserved and small fossil, just 3.2 cm long, which was immediately recognized as a human finger bone. The bone was scanned in three dimensions and its shape compared to various other finger bones, both of recent Homo sapiens individuals and bones from other species of primates and other forms of early humans, such as Neanderthals. The results conclusively showed that the finger bone, the first ancient human fossil found in Arabia, belonged to our own species. Using a technique called uranium series dating, a laser was used to make microscopic holes in the fossil and measure the ratio between tiny traces of radioactive elements. These ratios revealed that the fossil was 88,000 years old. Other dates obtained from associated animals fossils and sediments converged to a date of approximately 90,000 years ago. Further environmental analyses also revealed the site to have been a freshwater lake in an ancient grassland environment far removed from today’s deserts.